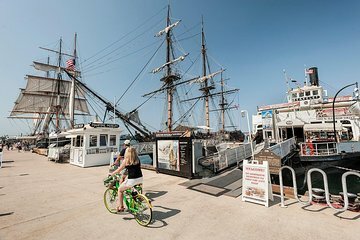 Sail back into history during this visit to the Maritime Museum of San Diego. Enjoy one of the world’s biggest collections of historic ocean vessels, including five ships and two submarines. You’ll view the USS Dolphin research submarine, a Soviet B-39 submarine, the iconic Star of India and the HMS Surprise (star of the ‘Master and Commander’ and ‘Pirates of the Caribbean films’) among others. A fun collection kid-friendly exhibits, plus an on-site maritime research library, round out the experience. We had no idea how great this would be. We were able to take our time wandering through all of these amazing boats. We're too young to remember the Cuban missile crisis, so the tour and experience of the Russian submarine really brought this history to life! The maritime museum is very interesting! It has ships from 1800s to a Russian submarine.